No country for old men.. The two “eternals enemies” had great moments both at an individual and team level in the double-game week we leave behind. The “reaction” of Roberts and Denmon, the change in execution timing in the reds offense, a super-Calathes and the “rise of the machines”. Hoopfellas’ analysis. When everything goes wrong, go back to basics. This was the title of our last post, and it was fully applied in different occasions last week. The rule is that really good teams that react when they experience marginal situations, and this reaction derives from the increased concentration they have in the game that follows and execute basic actions with great attention in detail. Most of these teams (in any league around the world, these are “unwritten” laws of basketball) usually focus on the part of the game in which they are more efficient. This (i.e. where they feel more comfortable) is where they will start regaining their confidence, find the solutions in their game, and make them “react”. Olympiacos did that at Istanbul relying on their defense. 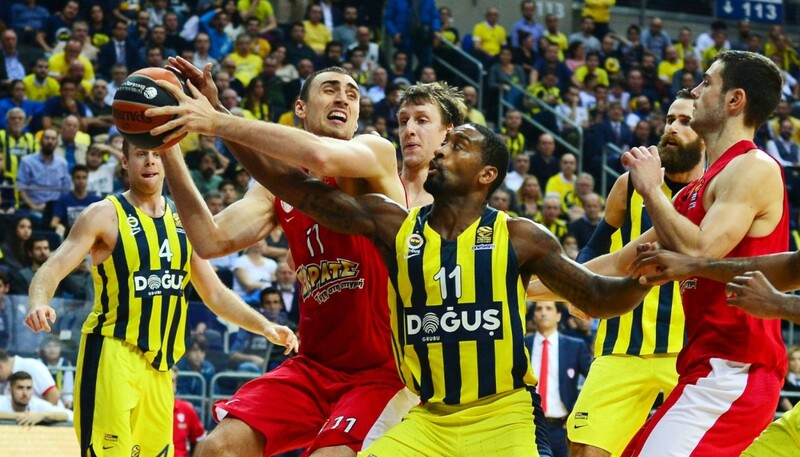 Fener then reacted at Moscow relying on their very good execution in half court. 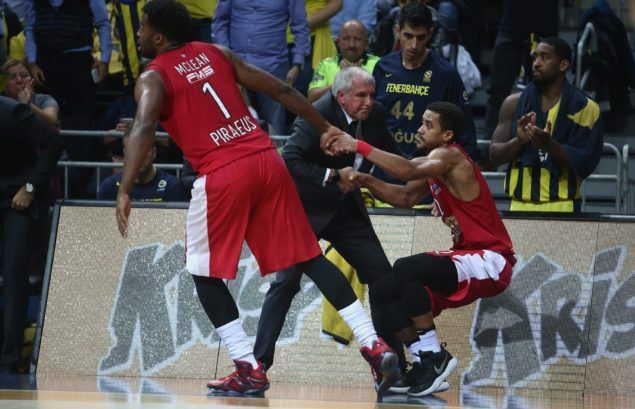 The foundations of the very good performance (that led to a great away win) of the Reds in Istanbul mainly relied on their physical dominance against coach Obradovic’s team. 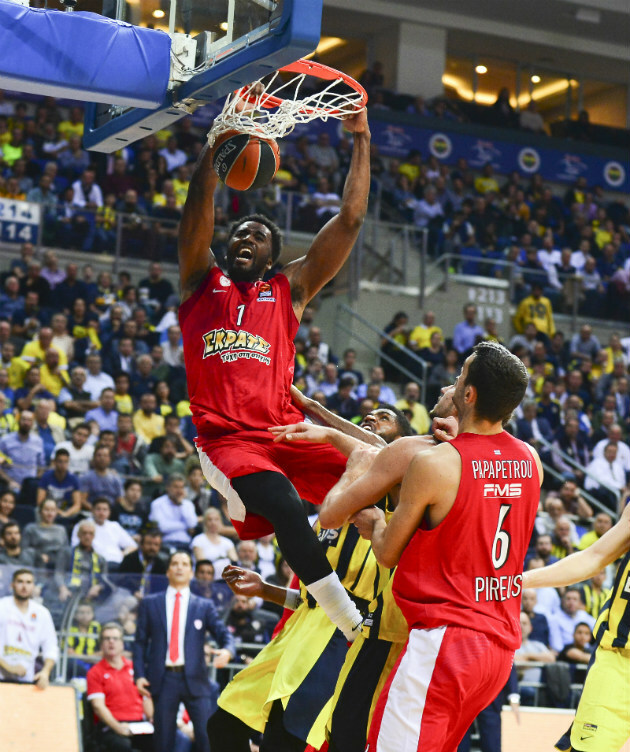 Olympiacos were the “strong” and “big” boy of this duel. The Greek team’s dominance in most personal battles (in terms of positioning) was gradually reflected in Ulker Sports Arena. The background of the last days required that from Giannis Sfairopoulos’ team. A war-like mentality, self-sacrifice, hustling. This was the minimum Olympiacos had to regain for their confidence, regardless of the outcome, leaving the court with “clean mentality”. Even though the Reds took a few beatings (good punches in terms of the frequency they appear and the efficiency within the tank called “Zoc’s Offensive Playbook”) in their body, they showed a very good perception rate and adjusted well in every second appearance of an offensive play of their opponents. See, for example, this Screen the Screener Action that ends up in an Elevator offense for Datome early in the first half. In the second half (against the same situation) the very good off the ball defense and Papanikolaou’s ability to break through screens or to match lost time in recovering with his “length” up high, constantly “froze” the ball and led to 1 on 1 offense, usually in the last seconds against the size of Olympiacos. The Reds were in trouble against Nunnaly’s curling, but they created many problems to Luigi Datome, a very able player in getting to his good spots to execute, minimizing close outs for him (one of the best in Europe in this), mainly because they managed to “get inside” Fener’s communication lines and make them question themselves regarding their ball movement for one side to the other (this is a team that work very much on their week side, and they are great in doing it). The Reds put much pressure within the space of a pass (thus interrupting their flow) and were very smart in defending against the way Fener tried to get their guards in the middle lane, opening up spaces and trying to get them to the rim. 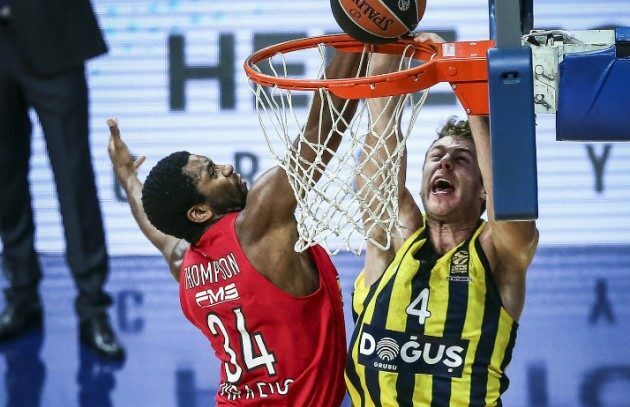 Of course, a team like Fenerbahce will manage to get quite a few blows in there with the way they get to the rim, keeping the fundamental path of their cooperations, but, if you manage to make them go to 1 on 1 (especially when we are talking about a defense like the Olympiacos defense, with bodies that can match Wannamaker’s physical profile) you are in good shape. I think that this was the first game in the season the Turks were looking for Dixon and the x-factor he brings with him, which can be so useful in these marginal situations. I think that the most useful conclusion from the two Olympiacos matches last week is the very important “adjustment” of coach Sfairopoulos, in order to change the productive status of their offense. The Reds played much faster in the half court, executing earlier in the available time of their possession, in an effort to dribble less, as opposed to the context the team is used to in the last few years with a charismatic PnR guard like Spanoulis. However, for the time being, this team does not have the PnR guard that can go deep with the ball and make it difficult for the defense with his advanced ballhandling and his creative ability. So, it was obvious that there was a direction for instant offense/execution after the first screen, whether it was a vertical screen or ball screen with the Reds getting into an execution process aiming at drives or short rolls and the weak side. 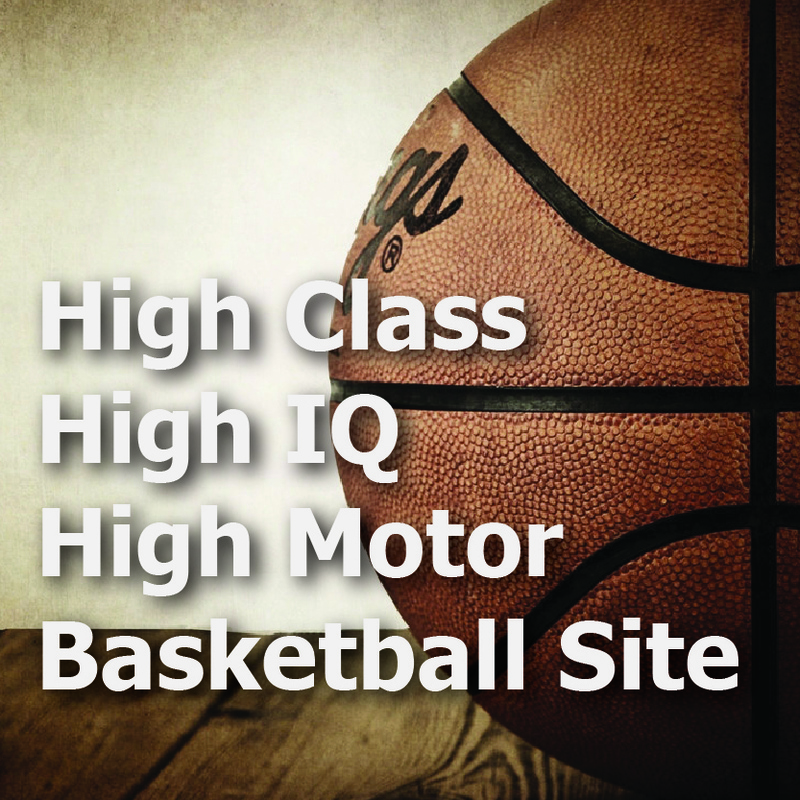 Minimum strong dribbling from the guard (which would make the defense against a ballhandler without slashing abilities stronger), pass, immediate execution. … we saw a determined battle of two different philosophies (just like last year, when Zoc used a lineup with Kalinic on the “top” and Antic at “3”) with CSKA playing Small all the way and Zoc playing with “twin towers” and Meli at “3” in an incredible battle that was decided by the Italian’s touch on the ball at the buzzer. Without the “absolution” of the back line called Udoh (in terms of his defensive action giving a “pardon” for every mistake of the first line), Fener needs Kalinic to become grittier and improve on their defensive rebounding, on which they are very behind. A significant week for the “Clover”. Xavi Pascual’s team got two very important wins, and was very improved in parts of their game in both sides of the court. For the first time this season Panathinaikos looks to be consistent and stand firmly on their feet, especially since coach Pascual seems to be finding the right formula for handling the team’s rotation. The Greens gave an impressive performance in the first game of the week, walking over George Bartsokas’ Khimki. This was by far their best performance of the season as we saw them playing balanced basketball. They were quite aggressive on defense (as the coach said, the Russians looked mentally unprepared for the home team’s contact game) and very productive on offense. Panathinaikos had 17/27 triples (incredible number) with Marcus Denmon (7/9 in less than 21 minutes) playing HORSE against the Russian defense. The 27-year-old guard from Missouri is an excellent shooter, but he is still trying to improve the quality of his shot selection, adapting to the new data of EL competition, and mainly the offensive environment of his new team. He is a “rhythm shooter” and if he starts, he can score in succession, even on defense from distance. The problem with Denmon is that his playing minutes are not guaranteed at the time. Panathinaikos has two SG in the “2” position, none of whom can play at “1” and run the offensive playbook of the team as the main ballhandler and main playmaker. This will help things and offer chances (through a wider range of lineups) for everyone, given the fact that Xavi Pascual starts with Lojeski at “2” and KC Rivers also plays there sometimes. So, there are times when Denmon (a player with traditionally good shot selection) falls into the trap of taking bad shots, as he doesn’t have the luxury of waiting for the game to come to him. I think that the less (ideally none) dribble we see from him before his execution, the more the chances of success are. As I said before, the important thing for him is to remain positive, even when he does not score much. He works well on defense (it says a lot that his coach trusts him in switches with very big men in the back line, which indicates his effort) and this will keep him competitive for the time being, buying him time to find his shots within this specific offensive environment. Their great numbers in outside shooting in this game helped the home team cover a few stints where their behaviour on offense was not exactly compatible with the pace they wanted to impose in that stint, when they were “too peripheral”, without a point of reference in the paint (slashing or posting). However, Khimki was so mentally off, that they were unable to pressure them at any point. It’s a good thing that, when analysing this tendency of the Greens, Ian Vougioukas was quite good in both these games, having 16 points in 17 minutes (5/6 two pointers, 6/7 free throws plus 6 fouls won), showing improvement in his finishing (even though he was once again “targeted” by their opponents on defense, the lack of playmaking from the Anadolu backcourt was in favour of the Greek defense and the Greek big man), which are the main source of his contribution in this roster. 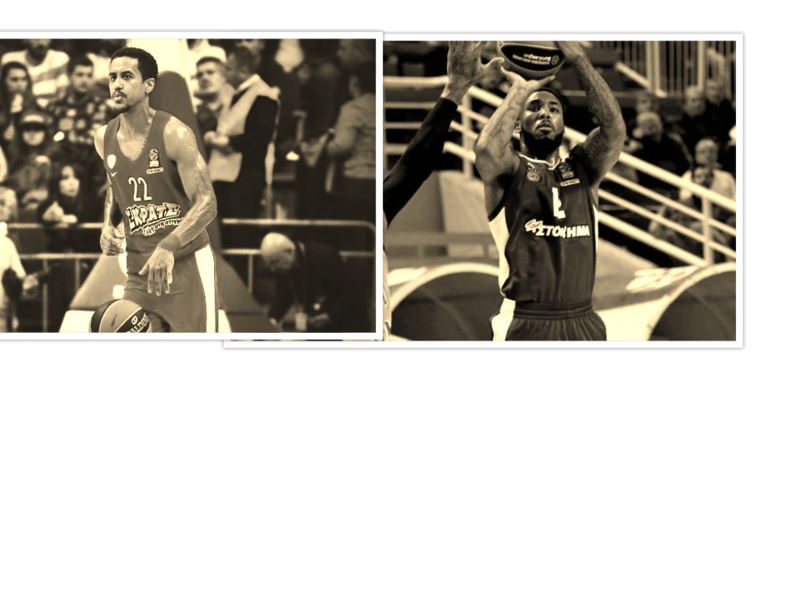 It’s also encouraging that in the Russian roulette of the fourth quarter, Gist only got on the court in the last two minutes, and made the decisive defensive play that gave the Greek team the win. In last week’s games there was an obvious improvement of the Greens in terms of timing on both sides of the court. There is better timing in the way they operate both defensively and offensively. In particular on offense, with Calathes directing the game, certain sets are worked to perfection, with the execution levels being among the best in the Euroleague. This can be gradually seen in the team’s offense, which due to their style must remain fresh and have high energy reserves. Xavi Pascual is looking for balance. 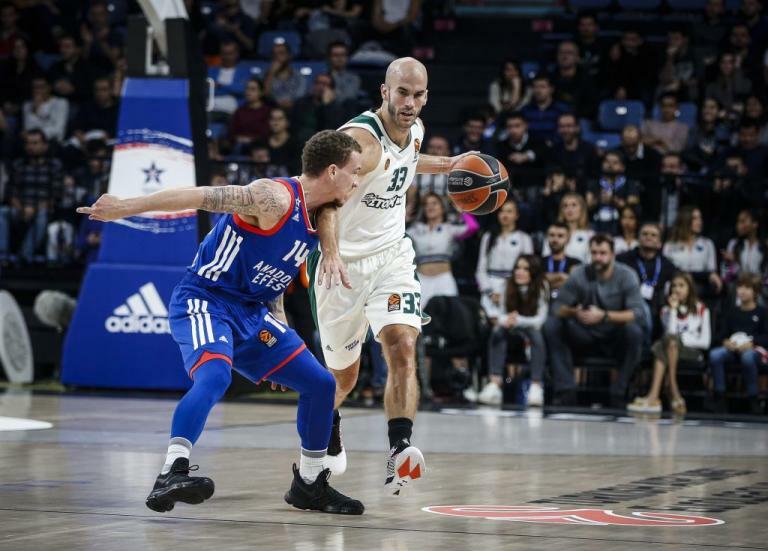 Panathinaikos has a strong “arsenal”, but their offense still relies on Calathes’ playmaking ability, not a context of flow that will arises from the nature of their offense. There are a few stints where the team seems to be static and finds it difficult to “look” at the weak side in the appropriate timing; this is a “look” that can activate many of the weapons they have in the wing positions. Perception and the level of self-awareness in relation to the direction they should follow, in conjunction with the lineup that is on the floor is certainly much better now. Overswitching is not on the menu any more. Anadolu’s big lineup with the two Centres (Stimac, Dunston) together on the floor was preventive (Anadolu didn’t have the guards that could “kill” behind the arc, one more reason). The Greens played Switch All only against the in-form McCollum (Hard Hedge on Side Picks), who is one of the most efficient midrange scorers in Europe. We are also seeing that there is an effort to include players with specific defensive weaknesses (Vougioukas, Lojeski) in lineups with players that can cover for them. Of course, there is still a long way for the team to get to the desired defensive standards, despite the fact that last week showed us that they are going in the right direction. Thanassis Antetokounmpo (he brings a very rare motor for European standards) has deservedly won the starting SF position. He and Calathes were the main reason that put Panathinaikos in the driver’s seat against Khimki, until the three pointers took over. The international forward (one of the main factors in this general change) may remind us of… Hanga on personal defense, but he must improve on his perception and automatic thinking in defensive rotations. On certain occasions Anadolu’s big men collaborated and scored because he was a bit behind on rotating. These are the details that make the defense look more solid. Gabriel as well… One would expect him to be more motivated. In Istanbul he made coach Pascual put him back on the bench, as, during the second period, when the Greens’ defense was lost (Anadolu scored 20 points in 6 minutes) and the home team tried to attack on Vougioukas’ poor footwork, every shot was scored on him (-13 for Panathinaikos with Gabriel on the floor, Motum was excellent and took advantage of every weakness both on or off the ball, he “punished” Gist’s overhelping in the middle lane, when the American player was trying to cover for Vougioukas). Panathinaikos are third in Effective Field Goal% in the Euroleague (deriving from their very good numbers in three pointers) with 57.6%. It will be very important to reduce their turnovers (the fact that they have new guards that are still learning their team plays its part) in order to become more efficient on offense. “That guy is a machine”. I used this expression when he came back to OAKA leaving his NBA dream behind, even if it was for a short period. The comparative advantage in terms of strength and endurance of a machine versus a human is granted. However, machines don’t have “emotional intelligence”. This disadvantage haunts the international PG the past years, as he doesn’t have the “sanctified” Balkan mentality that has affected the culture of basketball in terms of winning in Europe and you could see in every great player, first and foremost the great Greek guards of the modern era, who built their myth by triumphing under pressure. Nick’s case reminds me of the story of the British officers in India. Being slightly drunk on the occasion of a bet with the award being a bottle, a young officer climbed down the balcony and walked from one to the other side of the river stepping on the heads of vipers, which were all over the place. Being extremely confident, he went back to the same way and got back to his group, sharing the feeling of adrenaline, when it explodes inside you. After that, the officer was mentally at another level. He would never be the same again… He had convinced everyone, including himself, about the size of his heart. Calathes is maybe 2-3 viper heads away from the shore. If he manages to consistently close this kind of games and handle the risk in similar marginal situations, he will take the place he deserves in everyone’s mind. 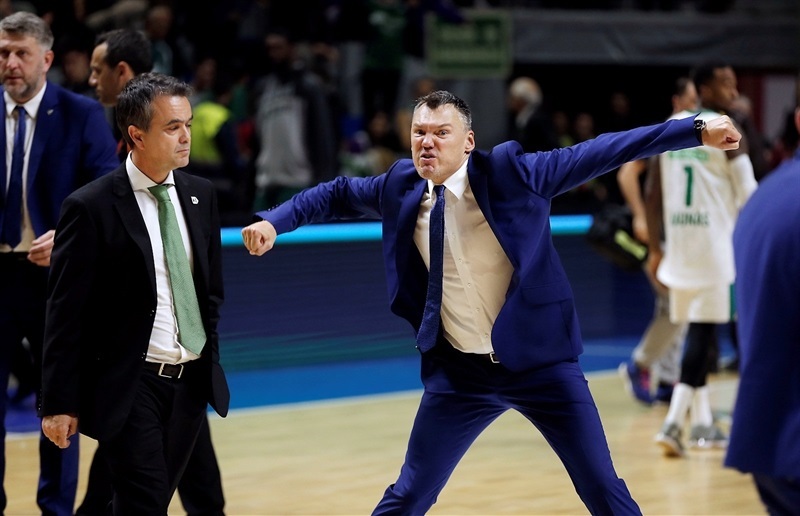 In the remaining 1.9 seconds, coach Jasikevicius shows another face, that of an offensive genius. Staggered and Weak Side Pop Out from Ulanovas. A Spot Midrange (not from a “5” that is outside his range) in conjunction with the remaining time is an excellent, safe choice with good success rate in its execution.